P7210 S35E Draken photoetched detail set for the 1/72 Scale Hasegawa kit. P7211 J35F/J Draken photoetched detail set for the 1/72 Scale Hasegawa kit. Conclusion: These sets will greatly enhance the detail of the Hasegawa 1/72 Draken, right where it is most needed. 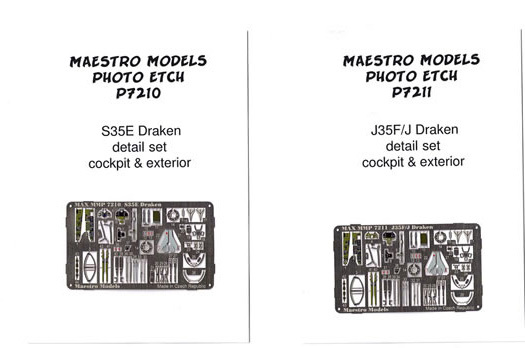 These photoetched metal sets are for the smaller scale Hasegawa Draken kit and have been produced by Eduard for Maestro. While Hasegawa’s kit features exquisite exterior detail, the cockpit and undercarriage are quite bland and these sets address that lack of detail perfectly. 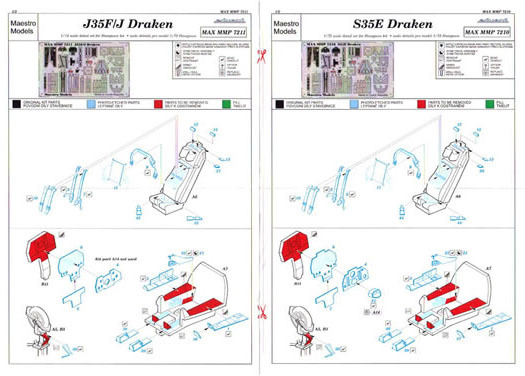 Even better, the sets offer the modeller the opportunity to accurately depict the cockpit of the reconnaissance version of the Draken, the S35E, with set P7210 or the later fighter variants with set P7211. A resin conversion set for the S35E (K7214) is offered by Maestro in their growing range of aftermarket products. Each set consists of around 40 parts which address the following areas: Seat, canopy, instrument panels and side consoles, main undercarriage and nose gear bay and select areas of the airframe. Most of those pieces intended for the cockpit are prepainted, simplifying the process for the modeller. 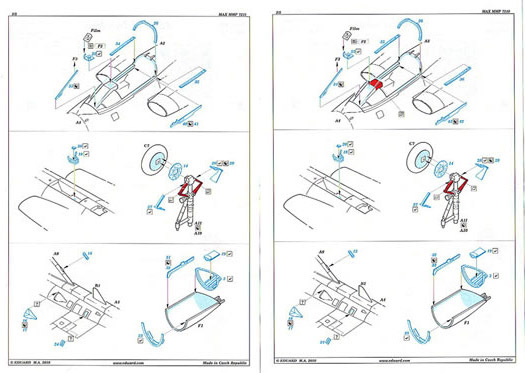 A crisply printed instruction sheet of A5 size clearly illustrates where the parts are to be applied and what preparation is required to accept the photoetch detail. There is very little folding required and the modeller does not need a high level of experience with etched metal to be able to assemble this set. These sets will greatly enhance the detail of the Hasegawa 1/72 Draken, right where it is most needed.